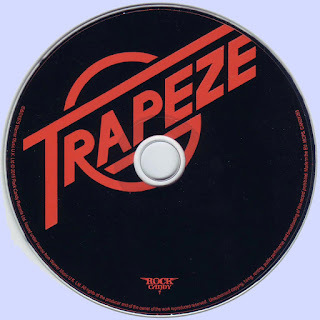 Refusing to succumb to defeat, Trapeze regrouped, this time adding two new members to fill the void left by Hughes whilst founding member Mel Galley assumed lead vocal duties. ‘Hot Wire’, the resultant album, was an impressive statement, sending out an unequivocal message that the band was far from spent. Indeed, their stature in the US and especially Texas, was further enhanced with intensive gigging and chart success. For their fifth album (confusingly self titled) the band continued their musical assault, unleashing a record that was more consistent with arena rock of the mid seventies. Released in 1976, produced by Steve Smith (Back Street Crawler, Rough Diamond and Detective) and recorded in London at Island Studios (mixed by an uncredited Eddie Kramer), the record showcases defiant swagger, and riffs to die for. It even contains two songs featuring Glenn Hughes who had remained a staunch supporter of the band.